Buffalo Wild Wings Grill and Bar is a restaurant chain specializing in wings, chicken tenders and a variety of sauces. The specific nutrition facts of each menu item varies greatly, with some items being relatively healthy and others containing almost an entire day's worth of calories, fat or sodium. Always check the nutrition facts before placing your order to ensure you make healthy dining choices. The wings and tenders are staples of Buffalo Wild Wings restaurants. Each wing contains 72 calories, 6 g of protein, 6 g of total fat, 1 g of saturated fat, 26 mg of cholesterol and only 66 mg of sodium. 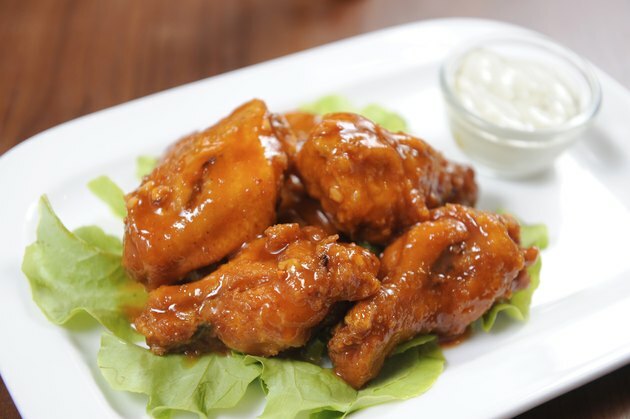 Each boneless wing has 88 calories, 6 g of protein, 3 g of total carbohydrates, 6 g of total fat, 2 g of saturated fat, 21 mg of cholesterol and only 178 mg of sodium. Each naked tender has 43 calories, 3 g of protein, 6 g of total carbohydrates, 2 g of sugars, 2 g of total fat, 8 mg of cholesterol and 570 mg of sodium, while each breaded tender has 100 calories, 5 g of protein, 15 g of total carbohydrates, 5 g of sugars, 1 g of dietary fiber, 11 g of total fat, 3 g of saturated fat, 18 mg of cholesterol and only 573 mg of sodium. You can coat the wings and tenders with the numerous sauces available at the restaurant. The amount of calories in a 1 oz. portion of any sauce ranges from 40 to 120 calories. Flavors that contain less than 50 calories include Sweet BBQ, Medium and Hot BBQ. Fat-free sauces include Sweet BBQ, Teriyaki, Honey BBQ, Asian Zing and Mango Habanera. The Parmesan Garlic contains 12 g of total fat, while the other sauces contain between 2 to 9 g of total fat. Some sauces contain high levels of sodium. These include the Teriyaki, Medium, Spicy Garlic, Hot, Wild and Blazin' sauces, which all contain well over 1,000 mg of sodium. The only sauce to contain protein is the Parmesan Garlic, which has 2 g of protein. The dipping sauces at Buffalo Wild Wings include honey mustard, blue cheese, ranch and southwestern ranch. The honey mustard contains only 80 calories, 6 g of total carbohydrates, 6 g of sugar, 6 g of total fat, 10 mg of cholesterol and 320 mg of sodium. The blue cheese has 280 calories, 2 g of protein, 2 g of total carbohydrates, 2 g of sugar, 30 g of total fat, 6 g of saturated fat, 10 mg of cholesterol and 480 mg of sodium. The ranch dressing and southwestern ranch dressing both contain 320 calories, 2 g of total carbohydrates, 2 g of sugar and 10 mg of cholesterol. The ranch dressing has 30 g of total fat, 4 g of saturated fat and 440 mg of sodium, while the southwestern ranch has 34 g of total fat, 5 g of saturated fat and 740 mg of sodium. The side items of Buffalo Wild Wings include potato wedges, French fries, onion rings or buffalo chips. A regular order of the buffalo chips contains the fewest calories. They have 257 calories, 5 g of protein, 47 g of total carbohydrates, 2 g of sugar, 5 g of dietary fiber, 5 g of total fat, 1 g of saturated fat and only 35 mg of sodium. A regular order of either the French fries or potato wedges contains 280 calories. The potato wedges have 5 g of protein, 40 g of total carbohydrates, 2 g of sugar, 5 g of dietary fiber, 14 g of total fat, 4 g of saturated fat and 1,073 mg of sodium. The French fries have 4 g of protein, 42 g of total carbohydrates, 2 g of sugar, 4 g of dietary fiber, 10 g of total fat, 3 g of saturated fat and 1,320 mg of sodium. A regular order of the onion rings contains 460 calories, have 4 g of protein, 52 g of total carbohydrates, 8 g of sugar, 4 g of dietary fiber, 26 g of total fat, 5 g of saturated fat and 960 mg of sodium. Getting a larger size or adding cheese to any of these sides significantly increases the nutrition fact amounts.